Destiny: Xur weapons, gear, and location, May 19-21 Bad Juju! 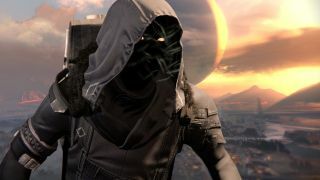 You'll have to excuse Xur if he's a little distracted this week, he's still going through all the new Destiny 2 stuff trying to work out if he's still alive. Or even actually alive...? He's a hood full of wisps, it's hard to classify that on a taxonomic scale. Anyway, he's in the Tower this week, just on the right, past the Speaker's house with this little lot. Star of the show this week (as it is when ever it appears) is Bad Juju. This is your semi-regular warning to buy the damn thing if you haven't already. It autoloads, buffs damage and charges your Super with every kill, and it has more accurate hipfire. There's nothing not to like about it. Elsewhere there's varying degrees of space-meh. The Titan's Eternal Warrior helmet is okay if you like a statuey aethstetic and punching things. The Unstoppable perk gives your invulnerability a boost when using the Fist of Havoc. It's handy for dealing with large enemy groups and ruining people's days in the Crucible. Maybe not an essential purchase though. For Hunters there's Skyburners Annex which isn't too bad for support if you have a well thought out team. It'll generate more Orbs on heavy weapons kills and give you extra special ammo when you collect Orbs yourself, but only if your Super's charged. So, a bit of a trade off but clever if you get the balance right. At least Heart of the Praxic Fire is worth considering if you're a Sunsinging Warlock - your agility gets a boost while your grenades and melee cooldowns are reduced when using Radiance. Buff are based on your grenade and melee stats though, so you might need a tune up to get the best from it. But well specced and you can lay waste to everything. And that's about it. The Ornaments for MIDA Multi-Tool and Red Death are entirely a matter of taste. Just remember to stock up on Shards and Three of Coins because you can  never  have  enough.